From a Digital Marketing point of view, it’s a vital and necessary to know all the Google updates and how Google Algorithm makes the search engine so accurate for the users. There are a lot of specific mathematics and logics behind these algorithms. We need to understand these very carefully. From SEO perspective, it is required to know why Google launches new update every now and then. It’s because Google always tries to improve the user experience. This is the ulterior objective. They work on providing a better result to the user to get the ultimate search satisfaction. Google has modified its search algorithm a lot of times. These modification gives the business owners a challenge and a chance to rank higher in the search engines. Getting better rank has become a difficult task, but not an impossible one. Let’s discuss the major algorithms and updates and their significant roles on Google search engine. d is a damping factor which can be set between 0 and 1. PageRank is nothing but a system of algorithms which calculates the link votes of a page from various sources. PageRank algorithm determines which pages are more valuable and which ones are less valuable per the above formula. Google uses PageRank algorithm along with text-matching technique to find pages that are both essential and relevant to your search. It is a web indexing system update through which Google provides 50% fresher search results than previous indexing system. Google rolled out the Caffeine update to completely reconfigure the search engine with an aim of better indexing, greater speed and more relevant search results. Google indexing process became so fast that search results were loading up to twice as fast as previous results. Pre-Caffeine, Google took a long time in indexing, crawling and ranking new pages or new content in a website. Post Caffeine update, Google started indexing so fast that the users started getting fresh and quick updates after any change in the web. Not only speed and size, Google Caffeine worked on the keywords relevancy as well. Search results became more accurate and relevant to the keyword you are searching for. When we talk about Google algorithms, importance of Google Panda update cannot be ignored. After releasing this update many sites were brutally affected. It became hard to recover their old rankings and traffic. It’s a technology to filter the content. Post this update Google targeted low-quality content sites and blocked them for better search experience. To get relief from this update you have to focus on Content quality that should be fresh and unique. Google’s Penguin update is one of the major updates that have a huge impact on search engine. This was rolled out to demote sites using prohibited SEO techniques like & improper link building and keyword stuffingetc. Penguin penalized those unethical pages by decreasing their rank. It did not penalize the entire website. Google suggested the site owners to use ethical link building and use proper anchor text instead of worrying about Penguin updates. Google rolled out yet another important change in update, which provided the users better search results and experience. Post EMD update , spammy sites of having wrong content with improper URL structure were removed completely from the search results. To stand out in search engine, it’s required to remove all the content that is irrelevant to the keywords used in URL structure. 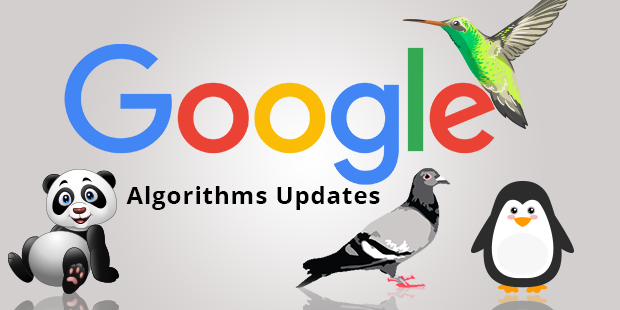 Google Pigeon is the local search algorithm update. The goal of this update was to increase the rank of local businesses in a search engine. This is helpful for the user who searches something locally and for the local business as well. The key part of this algorithm is to focus on location and distance, from which the users search. Post this update the local listing was getting more valuable to SEO entrepreneurs. This algorithm combines the web search and map search in a more copulative way. Hummingbird – the name suggests being precise and fast. Google Hummingbird update was designed to understand the meaning of the whole search query. Hummingbird was implemented to focus on the whole keyword phrase accurately. It does not show value to the pages that matched the exact keyword without having no meaning. It was just a change in process to calculate the search results in a better way. Google should give importance to those pages having original and high-quality content in a structured way. Post this update, semantics started playing a huge role in creating content. A modified version of Hummingbird update is RankBrain . It is an artificial intelligence program to help Google in processing the search results more accurately. It’s a machine learning technology which converts a huge amount of written language into mathematical form. Google RankBrain algorithm update is a part of Google’s overall search algorithm that is used to find the pages exactly relevant to the particular keywords. So create more content on the focused keywords and links them from the high authority pages is the best way to stand out in the competition. Google Rolled out a new Mobile Friendly algorithm to give a boost to mobile friendly pages. This is a vital one for SEO guys. It have a huge impact on mobile search results. Google checks, whether the pages are optimized properly for mobile or not. If your pages follow the Google Mobile-Friendly Guideline then its fine, otherwise you have to optimize your sites and pages to get better ranking in mobile searches. After the implementation of this, Google introduced AMP, which makes sites load even faster on mobile. There are various SEO tools that will surely help you to analyze your mobile-friendly pages. From an SEO perspective, people think these updates made optimizing the website difficult. But if you follow the right ethical way, Google awards you for sure. So if you have any doubts about the updates and want to get more details, we advise you to go through Google guidelines. It will help you making a Google friendly site that will boost your search ranking and traffic. If you have any questions, do comment in the section below.